Mailbox audit logging must be turned on for each user mailbox before user activity in Exchange Online will be logged. For more information, see Enable mailbox auditing in Office 365. Be sure to read the following items before you start searching the Office 365 audit log. You (or another admin) must first turn on audit logging before you can start searching the Office 365 audit log. To turn it on, just click Start recording user and admin activity on the Audit log search page in the Security & Compliance Center. (If you don't see this link, auditing has already been turned on for your organization.) After you turn it on, a message is displayed that says the audit log is being prepared and that you can run a search in a couple of hours after the preparation is complete. You only have to do this once. We're in the process of turning on auditing by default. Until then, you can turn it on as previously described. You have to be assigned the View-Only Audit Logs or Audit Logs role in Exchange Online to search the Office 365 audit log. By default, these roles are assigned to the Compliance Management and Organization Management role groups on the Permissions page in the Exchange admin center. Note that global administrators in Office 365 and Microsoft 365 are automatically added as members of the Organization Management role group in Exchange Online. 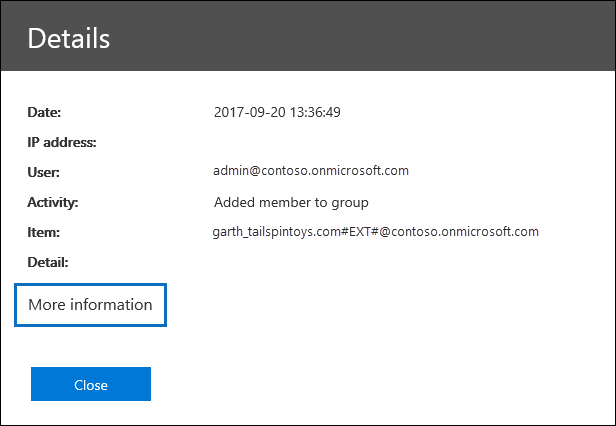 To give a user the ability to search the Office 365 audit log with the minimum level of privileges, you can create a custom role group in Exchange Online, add the View-Only Audit Logs or Audit Logs role, and then add the user as a member of the new role group. For more information, see Manage role groups in Exchange Online. If you assign a user the View-Only Audit Logs or Audit Logs role on the Permissions page in the Security & Compliance Center, they won't be able to search the Office 365 audit log. You have to assign the permissions in Exchange Online. This is because the underlying cmdlet used to search the audit log is an Exchange Online cmdlet. When an audited activity is performed by a user or admin, an audit record is generated and stored in the Office 365 audit log for your organization. The length of time that an audit record is retained (and searchable in the audit log) depends on your Office 365 subscription, and specifically the type of the license that is assigned to a specific user. Office 365 E3 - Audit records are retained for 90 days. That means you can search the audit log for activities that were performed within the last 90 days. Office 365 E5 - Audit records are retained for 365 days (one year). That means you can search the audit log for activities that were performed within the last year. Retaining audit records for one year is also available for users that are assigned an E3/Exchange Online Plan 1 license and have an Office 365 Advanced Compliance add-on license. The one-year retention period for audit records for E5 organizations (or E3 organizations that have Advanced Compliance add-on licenses) is currently available only as part of a private preview program. To enroll in this preview program, please file a request with Microsoft Support and include the following as the description of what you need help with: "Long-term Office 365 audit log private preview". For more information, see Turn off audit log search in Office 365. As previously stated, the underlying cmdlet used to search the audit log is an Exchange Online cmdlet, which is Search-UnifiedAuditLog. That means you can use this cmdlet to search the Office 365 audit log instead of using the Audit log search page in the Security & Compliance Center. You have to run this cmdlet in remote PowerShell connected to your Exchange Online organization. For more information, see Search-UnifiedAuditLog. If you want to programmatically download data from the Office 365 audit log, we recommend that you use the Office 365 Management Activity API instead of using a PowerShell script. The Office 365 Management Activity API is a REST web service that you can use to develop operations, security, and compliance monitoring solutions for your organization. For more information, see Office 365 Management Activity API reference. It can take up to 30 minutes or up to 24 hours after an event occurs for the corresponding audit log entry to be displayed in the search results. The following table shows the time it takes for the different services in Office 365. Azure Active Directory (Azure AD) is the directory service for Office 365. The unified audit log contains user, group, application, domain, and directory activities performed in the Microsoft 365 admin center or in the in Azure management portal. For a complete list of Azure AD events, see Azure Active Directory Audit Report Events. Exchange Online audit logs consist of two types of events: Exchange admin events (actions taken by administrators) and mailbox events (actions taken by users on mailboxes). Note that mailbox auditing isn't enabled by default. It must be enable for each user mailbox before mailbox events can be searched for in the Office 365 audit log. For more information about mailbox auditing and the mailbox auditing actions that are logged, see Enable mailbox auditing in Office 365. Audit logging for Power BI isn't enabled by default. To search for Power BI activities in the Office 365 audit log, you have to enable auditing in the Power BI admin portal. For instructions, see the "Audit logs" section in Power BI admin portal. Here's the process for searching the audit log in Office 365. Use a private browsing session (not a regular session) to access the Security & Compliance Center because this will prevent the credential that you are currently logged on with from being used. To open an InPrivate Browsing session in Internet Explorer or Microsoft Edge, just press CTRL+SHIFT+P. To open a private browsing session in Google Chrome (called an incognito window), press CTRL+SHIFT+N. In the left pane of the Security & Compliance Center, click Search, and then click Audit log search. You have to first turn on audit logging before you can run an audit log search. If the Start recording user and admin activity link is displayed, click it to turn on auditing. If you don't see this link, auditing has already been turned on for your organization. a. Activities Click the drop-down list to display the activities that you can search for. User and admin activities are organized in to groups of related activities. You can select specific activities or you can click the activity group name to select all activities in the group. You can also click a selected activity to clear the selection. After you run the search, only the audit log entries for the selected activities are displayed. Selecting Show results for all activities will display results for all activities performed by the selected user or group of users. Over 100 user and admin activities are logged in the Office 365 audit log. Click the Audited activities tab at the topic of this article to see the descriptions of every activity in each of the different Office 365 services. b. Start date and End date The last seven days are selected by default. Select a date and time range to display the events that occurred within that period. The date and time are presented in Coordinated Universal Time (UTC) format. The maximum date range that you can specify is 90 days. An error is displayed if the selected date range is greater than 90 days. If you're using the maximum date range of 90 days, select the current time for the Start date. Otherwise, you'll receive an error saying that the start date is earlier than the end date. If you've turned on auditing within the last 90 days, the maximum date range can't start before the date that auditing was turned on. c. Users Click in this box and then select one or more users to display search results for. The audit log entries for the selected activity performed by the users you select in this box are displayed in the list of results. Leave this box blank to return entries for all users (and service accounts) in your organization. d. File, folder, or site Type some or all of a file or folder name to search for activity related to the file of folder that contains the specified keyword. You can also specify a URL of a file or folder. If you use a URL, be sure the type the full URL path or if you just type a portion of the URL, don't include any special characters or spaces. Leave this box blank to return entries for all files and folders in your organization. If you're looking for all activities related to a site, add the wildcard symbol (*) after the URL to return all entries for that site; for example, "https://contoso-my.sharepoint.com/personal/*". The search results are loaded, and after a few moments they are displayed under Results. When the search is finished, the number of results found is displayed. Note that a maximum of 5,000 events will be displayed in the Results pane in increments of 150 events; if more than 5,000 events meet the search criteria, the most recent 5,000 events are displayed. You can select specific activities to search for by clicking on the activity name. Or you can search for all activities in a group (such as File and folder activities) by clicking on the group name. If an activity is selected, you can click it to cancel the selection. You can also use the search box to display the activities that contain the keyword that you type. You have to select Show results for all activities in the Activities list to display events from the Exchange admin audit log. Events from this audit log display a cmdlet name (for example, Set-Mailbox ) in the Activity column in the results. For more information, click the Audited activities tab in this topic and then click Exchange admin activities. Similarly, there are some auditing activities that don't have a corresponding item in the Activities list. If you know the name of the operation for these activities, you can search for all activities, then filter the results by typing the name of the operation in the box for the Activity column. See Step 3: Filter the search results for more information about filtering the results. Click Clear to clear the current search criteria. The date range returns to the default of the last seven days. You can also click Clear all to show results for all activities to cancel all selected activities. If 5,000 results are found, you can probably assume there are more than 5,000 events that met the search criteria. You can either refine the search criteria and rerun the search to return fewer results, or you can export all of the search results by selecting Export results > Download all results. The results of an audit log search are displayed under Results on the Audit log search page. As previously stated a maximum of 5,000 (newest) events are displayed in increments of 150 events. To display more events you can use the scroll bar in the Results pane or you can press Shift + End to display the next 150 events. The results contain the following information about each event returned by the search. Date: The date and time (in UTC format) when the event occurred. IP address: The IP address of the device that was used when the activity was logged. The IP address is displayed in either an IPv4 or IPv6 address format. User: The user (or service account) who performed the action that triggered the event. Activity: The activity performed by the user. This value corresponds to the activities that you selected in the Activities drop down list. For an event from the Exchange admin audit log, the value in this column is an Exchange cmdlet. Item: The object that was created or modified as a result of the corresponding activity. For example, the file that was viewed or modified or the user account that was updated. Not all activities have a value in this column. Detail: Additional detail about an activity. Again, not all activities will have a value. Click a column header under Results to sort the results. You can sort the results from A to Z or Z to A. Click the Date header to sort the results from oldest to newest or newest to oldest. You can view more details about an event by clicking the event record in the list of search results. A Details page is displayed that contains the detailed properties from the event record. The properties that are displayed depend on the Office 365 service in which the event occurs. To display these details, click More information. For descriptions, see Detailed properties in the Office 365 audit log. In addition to sorting, you can also filter the results of an audit log search. This is a great feature that can help you quickly filter the results for a specific user or activity. You can initially create a wide search and then quickly filter the results to see specific events. Then you can narrow the search criteria and re-run the search to return a smaller, more concise set of results. Run an audit log search. When the results are displayed, click Filter results. Keyword boxes are displayed under each column header. Click one of the boxes under a column header and type a word or phrase, depending on the column you're filtering on. The results will dynamically readjust to display the events that match your filter. To clear a filter, click the X in the filter box or just click Hide filtering. To display events from the Exchange admin audit log, type a - (dash) in the Activity filter box. This will display cmdlet names, which are displayed in the Activity column for Exchange admin events. Then you can sort the cmdlet names in alphabetical order. You can export the results of an audit log search to a comma separated value (CSV) file on your local computer. You can open this file in Microsoft Excel and use features such as search, sorting, filtering, and splitting a single column (that contains multi-value cells) into multiple columns. Run an audit log search, and then revise the search criteria until you have the desired results. Save loaded results Choose this option to export only the entries that are displayed under Results on the ** Audit log search ** page. The CSV file that is downloaded contains the same columns (and data) displayed on the page (Date, User, Activity, Item, and Details). An additional column (named More) is included in the CSV file that contains more information from the audit log entry. Because you're exporting the same results that are loaded (and viewable) on the Audit log search page, a maximum of 5,000 entries are exported. Download all results Choose this option to export all entries from the Office 365 audit log that meet the search criteria. For a large set of search results, choose this option to download all entries from the audit log in addition to the 5,000 results that can be displayed on the Audit log search page. This option will download the raw data from the audit log to a CSV file, and contains additional information from the audit log entry in a column named AuditData. It may take longer to download the file if you choose this export option because the file may be much larger than the one that's downloaded if you choose the other option. You can download a maximum of 50,000 entries to a CSV file from a single audit log search. If 50,000 entries are downloaded to the CSV file, you can probably assume there are more than 50,000 events that met the search criteria. To export more than this limit, try using a date range to reduce the number of audit log entries. You might have to run multiple searches with smaller date ranges to export more than 50,000 entries. After you select an export option, a message is displayed at the bottom of the window that prompts you to open the CSV file, save it to the Downloads folder, or save it to a specific folder. The Download all results option downloads the raw data from the Office 365 audit log to a CSV file. This file contains different column names (CreationDate, UserIds, Operation, AuditData) than the file that's downloaded if you select the Save loaded results option. The values in the two different CSV files for the same activity may also be different. For example, the activity in the Action column in the CSV file and may have a different value than the "user-friendly" version that's displayed in the Activity column on the Audit log search page; for example, MailboxLogin vs. User signed in to mailbox. If you download all results, the CSV file contains a column named AuditData, which contains additional information about each event. As previously stated, this column contains a multi-value property for multiple properties from the audit log record. Each of the property:value pairs in this multi-value property are separated by a comma. You can use the Power Query in Excel to split this column into multiple columns so that each property will have its own column. This will let you sort and filter on one or more of these properties. To learn how to do this, see the "Split a column by delimiter" section in Split a column of text (Power Query). After you split the AuditData column, you can filter on the Operations column to display the detailed properties for a specific type of activity. There's a 3,060-character limit for the data that's displayed in the AuditData field for an audit record. If the 3,060-character limit is exceeded, the data in this field is truncated. When you download all results from a search query that contains events from different Office 365 services, the AuditData column in the CSV file contains different properties depending on which service the action was performed in. For example, entries from Exchange and Azure AD audit logs include a property named ResultStatus that indicates if the action was successful or not. This property isn't included for events in SharePoint. Similarly, SharePoint events have a property that identifies the site URL for file and folder related activities. To mitigate this behavior, consider using different searches to export the results for activities from a single service. For a description of the properties that are listed in the AuditData column in the CSV file when you download all results, and the service each one applies to, see Detailed properties in the Office 365 audit log. The tables in this section describe the activities that are audited in Office 365. You can search for these events by searching the audit log in the security and compliance center. These tables group related activities or the activities from a specific Office 365 service. The tables include the friendly name that's displayed in the Activities drop-down list and the name of the corresponding operation that appears in the detailed information of an audit record and in the CSV file when you export the search results. For descriptions of the detailed information, see Detailed properties in the Office 365 audit log. Click one of the following links to go to a specific table. The following table describes the file and page activities in SharePoint Online and OneDrive for Business. User or system account accesses a file. This is related to the "Accessed file" (FileAccessed) activity. A FileAccessedExtended event is logged when the same person continually accesses a file for an extended period of time (up to 3 hours). The purpose of logging FileAccessedExtended events is to reduce the number of FileAccessed events that are logged when a file is continually accessed. This helps reduce the noise of multiple FileAccessed records for what is essentially the same user activity, and lets you focus on the initial (and more important) FileAccessed event. User checks in a document that they checked out from a document library. User checks out a document located in a document library. Users can check out and make changes to documents that have been shared with them. User copies a document from a site. The copied file can be saved to another folder on the site. User deletes a document from a site. User deletes a file from the recycle bin of a site. User deletes a file from the second-stage recycle bin of a site. SharePoint anti-virus engine detects malware in a file. User discards (or undos) a checked out file. That means any changes they made to the file when it was checked out are discarded, and not saved to the version of the document in the document library. User downloads a document from a site. User or system account modifies the content or the properties of a document located on a site. This is related to the "Modified file" (FileModified) activity. A FileModifiedExtended event is logged when the same person continually modifies a file for an extended period of time (up to 3 hours). The purpose of logging FileModifiedExtended events is to reduce the number of FileModified events that are logged when a file is continually modified. This helps reduce the noise of multiple FileModified records for what is essentially the same user activity, and lets you focus on the initial (and more important) FileModified event. User moves a document from its current location on a site to a new location. User deletes all minor versions from the version history of a file. The deleted versions are moved to the site's recycle bin. User deletes all versions from the version history of a file. The deleted versions are moved to the site's recycle bin. User deletes a version from the version history of a file. The deleted version is moved to the site's recycle bin. User renames a document on a site. User restores a document from the recycle bin of a site. User uploads a document to a folder on a site. User views a page on a site. This doesn't include using a Web browser to view files located in a document library. This is related to the "Viewed page" (PageViewed) activity. A PageViewedExtended event is logged when the same person continually views a web page for an extended period of time (up to 3 hours). The purpose of logging PageViewedExtended events is to reduce the number of PageViewed events that are logged when a page is continually viewed. This helps reduce the noise of multiple PageViewed records for what is essentially the same user activity, and lets you focus on the initial (and more important) PageViewed event. The following table describes the folder activities in SharePoint Online and OneDrive for Business. User copies a folder from a site to another location in SharePoint or OneDrive for Business. User creates a folder on a site. User deletes a folder from a site. User deletes a folder from the recycle bin on a site. User deletes a folder from the second-stage recycle bin on a site. User modifies a folder on a site. This includes changing the folder metadata, such as changing tags and properties. User moves a folder to a different location on a site. User renames a folder on a site. User restores a deleted folder from the recycle bin on a site. The following table describes the user sharing and access request activities in SharePoint Online and OneDrive for Business. For sharing events, the Detail column under Results identifies the name of the user or group the item was shared with and whether that user or group is a member or guest in your organization. For more information, see Use sharing auditing in the Office 365 audit log. Users can be either members or guests based on the UserType property of the user object. A member is usually an employee, and a guest is usually a collaborator outside of your organization. When a user accepts a sharing invitation (and isn't already part of your organization), a guest account is created for them in your organization's directory. Once the guest user has an account in your directory, resources may be shared directly with them (without requiring an invitation). An access request to a site, folder, or document was accepted and the requesting user has been granted access. User (member or guest) accepted a sharing invitation and was granted access to a resource. This event includes information about the user who was invited and the email address that was used to accept the invitation (they could be different). This activity is often accompanied by a second event that describes how the user was granted access to the resource, for example, adding the user to a group that has access to the resource. A permission level was added to a site collection. A user was added to the list of entities who can use this secure sharing link. The target user's domain isn't included in the list of allowed domains. The target user's domain is included in the list of blocked domains. For more information about allowing or blocking external sharing based on domains, see Restricted domains sharing in SharePoint Online and OneDrive for Business. An item was changed so that it no longer inherits permission levels from its parent. An item was changed so that it no longer inherits sharing permissions from its parent. User created a company-wide link to a resource. company-wide links can only be used by members in your organization. They can't be used by guests. User requests access to a site, folder, or document they don't have permissions to access. User created an anonymous link to a resource. Anyone with this link can access the resource without having to be authenticated. A secure sharing link was created to this item. User shared a resource in SharePoint Online or OneDrive for Business with a user who isn't in your organization's directory. A secure sharing link was deleted. An access request to a site, folder, or document was denied. A permission level was changed on a site collection. User removed a company-wide link to a resource. The link can no longer be used to access the resource. User removed an anonymous link to a resource. The link can no longer be used to access the resource. A permission level was removed from a site collection. A change was made so that an item inherits sharing permissions from its parent. User (member or guest) shared a file, folder, or site in SharePoint or OneDrive for Business with a user in your organization's directory. The value in the Detail column for this activity identifies the name of the user the resource was shared with and whether this user is a member or a guest. This activity is often accompanied by a second event that describes how the user was granted access to the resource; for example, adding the user to a group that has access to the resource. An access request to an item was updated. User updated an anonymous link to a resource. The updated field is included in the EventData property when you export the search results. An external sharing invitation was updated. An anonymous user accessed a resource by using an anonymous link. The user's identity might be unknown, but you can get other details such as the user's IP address. User (member or guest) unshared a file, folder, or site that was previously shared with another user. User accessed a resource by using a company-wide link. A user used a secure link. A user was added to the list of entities who can use a secure sharing link. A user was removed from the list of entities who can use a secure sharing link. User withdrew a sharing invitation to a resource. The following table lists file synchronization activities in SharePoint Online and OneDrive for Business. User successfully establishes a sync relationship with a site. The sync relationship is successful because the user's computer is a member of a domain that's been added to the list of domains (called the safe recipients list ) that can access document libraries in your organization. For more information about this feature, see Use Windows PowerShell cmdlets to enable OneDrive sync for domains that are on the safe recipients list. User tries to establish a sync relationship with a site from a computer that isn't a member of your organization's domain or is a member of a domain that hasn't been added to the list of domains (called the safe recipients list) that can access document libraries in your organization. The sync relationship is not allowed, and the user's computer is blocked from syncing, downloading, or uploading files on a document library. For information about this feature, see Use Windows PowerShell cmdlets to enable OneDrive sync for domains that are on the safe recipients list. User establishes a sync relationship and successfully downloads files for the first time to their computer from a document library. User successfully downloads any changes to files from a document library. This activity indicates that any changes that were made to files in the document library were downloaded to the user's computer. Only changes were downloaded because the document library was previously downloaded by the user (as indicated by the Downloaded files to computer activity). User establishes a sync relationship and successfully uploads files for the first time from their computer to a document library. User successfully uploads changes to files on a document library. This event indicates that any changes made to the local version of a file from a document library are successfully uploaded to the document library. Only changes are unloaded because those files were previously uploaded by the user (as indicated by the ** Uploaded files to document library ** activity). The following table lists the events that result from site administration tasks in SharePoint Online. A SharePoint or global administrator adds a user agent to the list of exempt user agents in the SharePoint admin center. Site collection administrator or owner adds a person as a site collection administrator for a site. Site collection administrators have full control permissions for the site collection and all subsites. This activity is also logged when an admin gives themselves access to a user's OneDrive account (by editing the user profile in the SharePoint admin center or by using the Microsoft 365 admin center). Site collection administrator or owner removes a person as a site collection administrator for a site. This activity is also logged when an admin removes themselves from the list of site collection administrators for a user's OneDrive account (by editing the user profile in the SharePoint admin center). Note that to return this activity in the audit log search results, you have to search for all activities. User added a member or guest to a SharePoint group. This might have been an intentional action or the result of another activity, such as a sharing event. Site administrator or owner adds a permission level to a site that allows a user assigned that permission to create a group for that site. A SharePoint or global administrator successfully cancels a SharePoint or OneDrive site geo move. The Multi-Geo capability lets an Office 365 organization span multiple Office 365 datacenter geographies, which are called geos. For more information, see Multi-Geo Capabilities in OneDrive and SharePoint Online in Office 365. A SharePoint or global administrator changed a SharePoint sharing policy by using the Office 365 admin portal, SharePoint admin portal, or SharePoint Online Management Shell. Any change to the settings in the sharing policy in your organization will be logged. The policy that was changed is identified in the ModifiedProperties field in the detailed properties of the event record. A SharePoint or global administrator changed the unmanaged devices policy for your organization. This policy controls access to SharePoint, OneDrive, and Office 365 from devices that aren't joined to your organization. Configuring this policy requires an Enterprise Mobility + Security subscription. For more information, see Control access from unmanaged devices. A SharePoint or global administrator customized the list of exempt user agents in the SharePoint admin center. You can specify which user agents to exempt from receiving an entire web page to index. This means when a user agent you've specified as exempt encounters an InfoPath form, the form will be returned as an XML file, instead of an entire web page. This makes indexing InfoPath forms faster. A SharePoint or global administrator changed the location-based access policy (also called a trusted network boundary) in the SharePoint admin center or by using SharePoint Online PowerShell. This type of policy controls who can access SharePoint and OneDrive resources in your organization based on authorized IP address ranges that you specify. For more information, see Control access to SharePoint Online and OneDrive data based on network location. A site geo move that was scheduled by a global administrator in your organization was successfully completed. The Multi-Geo capability lets an Office 365 organization span multiple Office 365 datacenter geographies, which are called geos. For more information, see Multi-Geo Capabilities in OneDrive and SharePoint Online in Office 365. Site administrator or owner creates a group for a site, or performs a task that results in a group being created. For example, the first time a user creates a link to share a file, a system group is added to the user's OneDrive for Business site. This event can also be a result of a user creating a link with edit permissions to a shared file. A SharePoint or global administrator creates a new Send To connection on the Records management page in the SharePoint admin center. A Send To connection specifies settings for a document repository or a records center. When you create a Send To connection, a Content Organizer can submit documents to the specified location. A SharePoint or global administrator creates a new site collection in your SharePoint Online organization or a user provisions their OneDrive for Business site. User deletes a group from a site. A SharePoint or global administrator deletes a Send To connection on the Records management page in the SharePoint admin center. Site administrator deletes a site. Site administrator enables document preview for a site. Site administrator or owner adds the SharePoint 2013 Workflow Task content type to the site. Global administrators can also enable work flows for the entire organization in the SharePoint admin center. Site administrator enables Office on Demand, which lets users access the latest version of Office desktop applications. Office on Demand is enabled in the SharePoint admin center and requires an Office 365 subscription that includes full, installed Office applications. Site administrator or owner enables RSS feeds for a site. Global administrators can enable RSS feeds for the entire organization in the SharePoint admin center. The access request settings were modified on a site. The Members Can Share setting was modified on a site. Site administrator or owner (or system account) changes the permission level that are assigned to a group on a site. This activity is also logged if all permissions are removed from a group. > [!NOTE]> This operation has been deprecated in SharePoint Online. 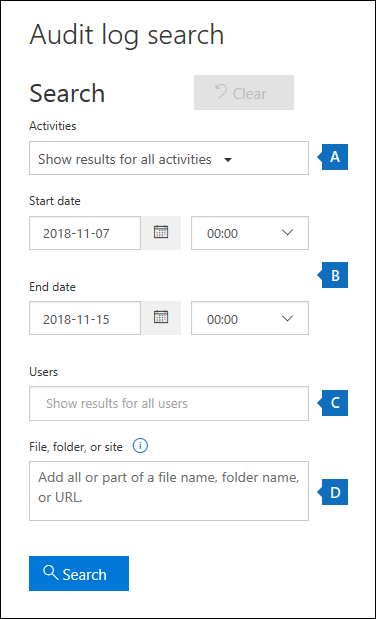 To find related events, you can search for other permission-related activities such as Added site collection admin, Added user or group to SharePoint group, Allowed user to create groups, Created group, and Deleted group. User removed a member or guest from a SharePoint group. This might have been an intentional action or the result of another activity, such as an unsharing event. User requests to be added as a site collection administrator for a site collection. Site collection administrators have full control permissions for the site collection and all subsites. A SharePoint or global administrator successfully schedules a SharePoint or OneDrive site geo move. The Multi-Geo capability lets an Office 365 organization span multiple Office 365 datacenter geographies, which are called geos. For more information, see Multi-Geo Capabilities in OneDrive and SharePoint Online in Office 365. A SharePoint or global administrator changes the designated site to host personal or OneDrive for Business sites. Site administrator or owner changes the settings of a group for a site. This can include changing the group's name, who can view or edit the group membership, and how membership requests are handled. The following table lists the activities that can be logged by mailbox audit logging. Mailbox activities performed by the mailbox owner, a delegated user, or an administrator are logged. By default, mailbox auditing in Office 365 isn't turned on. Mailbox audit logging must be turned on for each mailbox before mailbox activity will be logged. For more information, see Enable mailbox auditing in Office 365. An administrator assigned the FullAccess mailbox permission to a user (known as a delegate) to another person's mailbox. The FullAccess permission allows the delegate to open the other person's mailbox, and read and manage the contents of the mailbox. A message was classified as a record. This occurs when a retention label that classifies content as a record is manually or automatically applied to a message. A message was copied to another folder. An item is created in the Calendar, Contacts, Notes, or Tasks folder in the mailbox; for example, a new meeting request is created. Note that creating, sending, or receiving a message isn't audited. Also, creating a mailbox folder is not audited. A message was permanently deleted or deleted from the Deleted Items folder. These items are moved to the Recoverable Items folder. Messages are also moved to the Recoverable Items folder when a user selects it and presses Shift+Delete. A message was moved to another folder. A message was deleted and moved to the Deleted Items folder. A folder permission was changed. Folder permissions control which users in your organization can access mailbox folders and the messages in the folder. A message was purged from the Recoverable Items folder (permanently deleted from the mailbox). An administrator removed the FullAccess permission (that was assigned to a delegate) from a person's mailbox. After the FullAccess permission is removed, the delegate can't open the other person's mailbox or access any content in it. A message was sent using the SendAs permission. This means another user sent the message as though it came from the mailbox owner. A message was sent using the SendOnBehalf permission. This means another user sent the message on behalf of the mailbox owner. The message indicates to the recipient who the message was sent on behalf of and who actually sent the message. A calendar delegation was assigned to a mailbox. Calendar delegation gives someone else in the same organization permissions to manage the mailbox owner's calendar. A message or its properties was changed. An inbox rule has been added, removed, or changed. Inbox rules are used to process messages in the user's Inbox based on the specified conditions and take actions when the conditions of a rule are met, such as moving a message to a specified folder or deleting a message. To return entries for inbox rule activities, you have to select Show results for all activities in the Activities list. Use the date range boxes and the Users list to narrow the search results. The following table lists user and admin activities in Sway. Sway is an Office 365 app that helps users gather, format, and share ideas, stories, and presentations on an interactive, web-based canvas. For more information, see Frequently asked questions about Sway - Admin Help. User changes the share level of a Sway. This event captures the user changing the scope of sharing associated with a Sway; for example, public versus inside the organization. User disables duplication of a Sway. User enables duplication of a Sway; the ability for a user to enable duplication of a Sway is enabled by default. User stops sharing a Sway by revoking access to it. Revoking access changes the links associated with a Sway. User intends to share a Sway. This event captures the user action of clicking a specific share destination within the Sway share menu. The event doesn't indicate whether the user completed the share action. Administrator disables external Sway sharing for the entire organization by using the Microsoft 365 admin center. Administrator enables external Sway sharing for the entire organization by using the Microsoft 365 admin center. Administrator disables Sway for the entire organization by using the Microsoft 365 admin center. Administrator enables Sway for the entire organization by using the Microsoft 365 admin center (Sway service is enabled by default). The following table lists user administration activities that are logged when an admin adds or changes a user account by using the Microsoft 365 admin center or the Azure management portal. An Office 365 user account was created. The license assigned to a user what changed. To see what licenses were changes, see the corresponding Updated user activity. Administrator changed the password the password for a user. An Office 365 user account was deleted. Administrator reset the password for a user. Administrator set the property that forces a user to change their password the next time the user sign in to Office 365. Administrator modifies the properties of a licensed assigned to a user. Administrator changes one or more properties of a user account. For a list of the user properties that can be updated, see the "Update user attributes" section in Azure Active Directory Audit Report Events. The following table lists group administration activities that are logged when an admin or a user creates or changes an Office 365 group or when an admin creates a security group by using the Microsoft 365 admin center or the Azure management portal. For more information about groups in Office 365, see View, create, and delete Groups in the Microsoft 365 admin center. A member was added to a group. A member was removed from a group. A property of a group was changed. The following table lists application admin activities that are logged when an admin adds or changes an application that's registered in Azure AD. Any application that relies on Azure AD for authentication must be registered in the directory. A authentication permission was created/granted to an application in Azure AD. An application was registered in Azure AD. An application is represented by a service principal in the directory. Credentials were added to a service principal in Azure AD. A service principle represents an application in the directory. A authentication permission was removed from an application in Azure AD. An application was deleted/unregistered from Azure AD. An application is represented by a service principal in the directory. Credentials were removed from a service principal in Azure AD. A service principle represents an application in the directory. An authentication permission was updated for an application in Azure AD. The following table lists Azure AD role administration activities that are logged when an admin manages admin roles in the Microsoft 365 admin center or in the Azure management portal. Added a user to an admin role in Office 365. Removed a user to from an admin role in Office 365. Updated the company-level contact preferences for your Office 365 organization. This includes email addresses for subscription-related email sent by Office 365, as well as technical notifications about Office 365 services. The following table lists Azure AD directory and domain related activities that are logged when an administrator manages their Office 365 organization in the Microsoft 365 admin center or in the Azure management portal. For a list and detailed description of the eDiscovery activities that are logged, see Search for eDiscovery activities in the Office 365 audit log. It takes up to 30 minutes for events that result from the activities listed under eDiscovery activities in the Activities drop-down list to be displayed in the search results. Conversely, it takes up to 24 hours for the corresponding events from eDiscovery cmdlet activities to appear in the search results. You can search the audit log for activities in Power BI. For information about Power BI activities, see the "Activities audited by Power Power BI" section in Using auditing within your organization. Note that audit logging for Power BI isn't enabled by default. To search for Power BI activities in the Office 365 audit log, you have to enable auditing in the Power BI admin portal. For instructions, see the "Audit logs" section in Power BI admin portal. Workplace Analytics provides insight into how groups collaborate across your Office 365 organization. The following table lists activities performed by users that are assigned the Administrator role or the Analyst roles in Workplace Analytics. Users assigned the Analyst role have full access to all service features and use the product to do analysis. Users assigned the Administrator role can configure privacy settings and system defaults, and can prepare, upload, and verify organizational data in Workplace Analytics. For more information, see Workplace Analytics. Analyst accessed the OData link for a query. Analyst canceled a running query. Analyst created a new meeting exclusion rule. Analyst deleted a query result. Analyst downloaded a query result file. Admin updated data access settings. Admin updated privacy settings; for example, minimum group size. Admin uploaded organizational data file. Analyst viewed visualizations in one or more Explore page tabs. A user adds a bot to a team. A user adds a channel to a team. A user adds a connector to a channel. A team owner adds member(s) to a team. A user adds a tab to a channel. The ChannelSettingChanged operation is logged when the following activities are performed by a team member. For each of these activities, a description of the setting that was changed (shown in parenthesis below) is displayed in the Item column in the audit log search results. - Changes the name of a team channel ( Channel name). - Changes the description of a team channel ( Channel description). The TeamsTenantSettingChanged operation is logged when the following activities are performed by a global admin (using the Microsoft 365 admin center); note that these activities affect organization-wide Microsoft Teams settings. For more information, see Administrator settings for Microsoft Teams. For each of these activities, a description of the setting that was changed (shown in parenthesis below) is displayed in the Item column in the audit log search results. - Enables or disables Microsoft Teams for the organization ( Microsoft Teams). - Enables or disables interoperability between Microsoft Teams and Skype for Business for the organization ( Skype for Business interoperability). - Enables or disables the organizational chart view in Microsoft Teams clients ( Org chart view). - Enables or disables the ability for team members to schedule private meetings ( Private meeting scheduling). - Enables or disables the ability for team members to schedule channel meetings ( Channel meeting scheduling). - Enables or disables video calling in Teams meetings ( Video for Skype meetings). - Enables or disables screen sharing in Microsoft Teams meetups for the organization ( Screen sharing for Skype meetings). - Enables or disables that ability to add animated images (called Giphys) to Teams conversations ( Animated images). - Changes the content rating setting for the organization ( Content rating). The content rating restricts the type of animated image that can be displayed in conversations. - Enables or disables the ability for team members to add customizable images (called custom memes) from the Internet to team conversations ( Customizable images from the Internet). - Enables or disables the ability for team members to add editable images (called stickers) to team conversations ( Editable images). - Enables or disables that ability for team members to use bots in Microsoft Teams chats and channels ( Org-wide bots). - Enables specific bots for Microsoft Teams; this doesn't include the T-Bot, which is Teams help bot that's available when bots are enabled for the organization ( Individual bots). - Enables or disables the ability for team members to add extensions or tabs ( Extensions or tabs). - Enables or disables the side-loading of proprietary Bots for Microsoft Teams ( Side loading of Bots). - Enables or disables the ability for users to send email messages to a Microsoft Teams channel ( Channel email). A team owner changes the role of member(s) in a team. The following values indicate the Role type assigned to the user. 1 - Indicates the Owner role. 2 - Indicates the Member role. 3 - Indicates the Guest role. The Members property also includes the name of your organization, and the member's email address. The TeamSettingChanged operation is logged when the following activities are performed by a team owner. For each of these activities, a description of the setting that was changed (shown in parenthesis below) is displayed in the Item column in the audit log search results. - Changes the access type for a team. Teams can be set as Private or Public ( Team access type). When a team is private (the default setting), users can access the team only by invitation. When a team is public, it's discoverable by anyone. - Changes the information classification of a team ( Team classification). For example, team data can be classified as high business impact, medium business impact, or low business impact. - Changes the name of a team ( Team name). - Changes the team description ( Team description). - Changes made to any of the team settings. A team owner can access these settings in a Teams client by right-clicking a team, clicking Manage team, and then clicking the Settings tab. For these activities, the name of the setting that was changed is displayed in the Item column in the audit log search results. A user creates a new team. A user deletes a channel from a team. A team owner deletes a team. A user removes a bot from a team. A user removes connector from a channel. A team owner removes member(s) from a team. A user removes a tab from a channel. A user modified a connector in a channel. A user modified a tab in a channel. A user signs in to a Microsoft Teams client. The following table lists the user and admin activities in Yammer that are logged in the Office 365 audit log. To return Yammer-related activities from the Office 365 audit log, you have to select Show results for all activities in the Activities list. Use the date range boxes and the Users list to narrow the search results. Verified admin updates the setting for the network data retention policy to either Hard Delete or Soft Delete. Only verified admins can perform this operation. Network or verified admin changes the Yammer network's configuration. This includes setting the interval for exporting data and enabling chat. Network or verified admin changes the information that appears on member profiles for network users network. Verified admin turns Private Content Mode on or off. This mode lets an admin view posts in private groups and view private messages between individual users (or groups of users). Only verified admins only can perform this operation. Verified admin updates the Yammer network's security configuration. This includes setting password expiration policies and restrictions on IP addresses. Only verified admins can perform this operation. User creates a new group. A group is deleted from Yammer. Verified admin exports Yammer network data. Only verified admins can perform this operation. User shares a file with another user. Network or verified admin suspends (deactivates) a user from Yammer. User account is suspended (deactivated). User changes the description of a file. User changes the name of a file. You can search the audit log for activities in Microsoft Flow. These activities include creating, editing and deleting flows, and changing flow permissions. For information about auditing for Flow activities, see the blog Microsoft Flow audit events now available in Security & Compliance Center. You can search the audit log for app-related activities in PowerApps. These activities include creating, launching, and publishing an app. Assigning permissions to apps is also audited. For a description of all PowerApps activities, see Activity logging for PowerApps. You can search the audit log for activities in Microsoft Stream. These activities include video activities performed by users, group channel activities, and admin activities such as managing users, managing organization settings, and exporting reports. For a description of these activities, see the "Activities logged in Microsoft Stream" section in Audit Logs in Microsoft Stream. Exchange administrator audit logging—which is enabled by default in Office 365—logs an event in the Office 365 audit log when an administrator (or a user who has been assigned administrative permissions) makes a change in your Exchange Online organization. Changes made by using the Exchange admin center or by running a cmdlet in Windows PowerShell are logged in the Exchange admin audit log. For more detailed information about admin audit logging in Exchange, see Administrator audit logging. To return entries from the Exchange admin audit log, you have to select Show results for all activities in the Activities list. Use the date range boxes and the Users list to narrow the search results for cmdlets run by a specific Exchange administrator within a specific date range. To display events from the Exchange admin audit log, filter the search results and type a - (dash) in the Activity filter box. This will display cmdlet names, which are displayed in the Activity column for Exchange admin events. Then you can sort the cmdlet names in alphabetical order. To get information about what cmdlet was run, which parameters and parameter values were used, and what objects were affected, you will have to export the search results and select the Download all results option. You can also view events in the Exchange admin audit log by using the Exchange admin center. For instructions, see View the administrator audit log. Where can I find about the features offered by the auditing service in Office 365? For more information about the auditing and reporting features available in Office 365, see Auditing and Reporting in Office 365. What are different Office 365 services that are currently audited? The most used Office 365 services like Exchange Online, SharePoint Online, OneDrive for Business, Azure Active Directory, Microsoft Teams, Dynamics 365, Advanced Threat Protection, and Power BI are audited. See the beginning of this article for a list of services that are audited. What activities are audited by auditing service in Office 365? See the Audited activities section in this article for a list and description of the activities that are audited in Office 365. How long does it take for an auditing record to be available after an event has occurred? Most auditing data is available within 30 minutes but it may take up to 24 hours after an event occurs for the corresponding audit log entry to be displayed in the search results. See the table in the Before you begin section of this article that shows the time it takes for events in the different Office 365 services to be available. How long are the audit records retained for? As previously explained, the retention period for audit records depends on your organization's Office 365 subscription. Office 365 E3 - Audit records are retained for 90 days. Office 365 E5 - Audit records are retained for 365 days (one year). Retaining audit records for one year is also available for organizations that have an E3 subscription and an Office 365 Advanced Compliance add-on subscription. As previously explained, the one-year retention period for audit records for E5 organizations (or E3 organizations that have Advanced Compliance add-on licenses) is currently available only as part of a private preview program. To enroll in this preview program, please file a request with Microsoft Support and include the following as the description of what you need help with: "Long-term Office 365 audit log private preview". Also note that the duration of the retention period for audit records is based on per-user licensing. For example, if a user in your organization is assigned an Office 365 E3 license, then the audit records for activities performed by that user are retained for 90 days. If a different user is assigned an Office 365 E5 license, their audit records are retained for one year. Can I access the auditing data programmatically? Yes. The Office 365 Management Activity API is used to fetch the audit logs programmatically. To get started, see Get started with Office 365 Management APIs. Are there other ways to get auditing logs other than using the security and compliance center or the Office 365 Management Activity API? No. These are the only two ways to get data from the Office 365 auditing service. Do I need to individually enable auditing in each service that I want to capture audit logs for? In most Office 365 services, auditing is enabled by default after you initially turn on auditing for your Office 365 organization (as described in the Before you begin section in this article). However, you have to enable mailbox auditing in Exchange Online for each mailbox that you want to audit. We are working on enabling mailbox auditing by default for all mailboxes in an Office 365 organization. For more information, see "Exchange mailbox auditing will be enabled by default" in the Microsoft Security, Privacy, and Compliance blog. Does the Office 365 auditing service support de-duplication of records? No. The auditing service pipeline is near real time, and therefore can't support de-duplication. Does Office 365 auditing data flow across geographies? No. We currently have auditing pipeline deployments in the NA (North America), EMEA (Europe, Middle east and Africa) and APAC (Asia Pacific) regions. However, we may flow the data across these regions for load-balancing and only during live-site issues. When we do perform these activities, the data in transit is encrypted. Auditing data is stored in Exchange mailboxes (data at rest) in the same region where the auditing pipeline is deployed. This data is not encrypted. However, data in transit is always encrypted.